Depew, D. J. and Weber, B. H. 1995. Darwinism Evolving: Systems Dynamics and the Genealogy of Natural Selection. MIT Press/A Bradford Book. Cambridge, Massachusetts. Irreducible complexity has been brought forth as an argument by opponents of Darwinian evolutionary theory in respect to certain biological systems allegedly being too complex to have evolved from simpler, or "less complete" predecessors through natural selection. The argument is central to the proponents of intelligent design, opponents to evolutionary theory. It is rejected by the scientific community at large, which overwhelmingly regards intelligent design as pseudoscience. In respect to systems sciences, the issue of irreducible complexity is interesting because it illustrates an essential particularity of systems, the aspect of emergent properties from the interaction of components which by themselves do not show these properties. Repeatedly, evolutionary theorists noticed that the principle of natural selection from variation through mutation, though well suited to explain gradual developments, is deficient when it comes to explain macro-evolution, that is, the origin of new species or new functional modules in such species. The analytical problem in this regard is the complexity of such modules if they are "composed of several interacting parts that contribute to the basic function, [... but ...] the removal of any one of the parts causes the system to effectively cease functioning" (Behe 1996). It is argued that there is no linear path for evolution on which the functional combination of these parts can be reached from separated non-functional parts. No selection would work on these non-functional components combining them into a functional module. Since anything less than the complete module is dysfunctional, or would in fact be even detrimental to the organism, the non-functional component would not have survived any (preceding) process of natural selection. 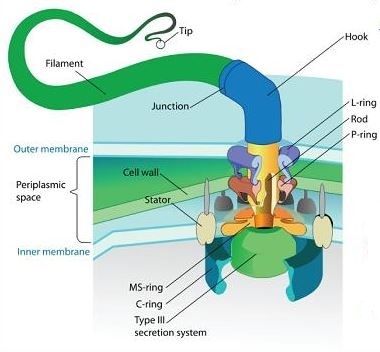 The example which became famous in this context is the bacterial flagellum, a lash-like appendage to certain prokaryotic and eukaryotic cells that protrudes from their cell's body and serves as a basic mean of locomotion. Using an intra-cellular energy gradient, this flagellum allows the bacterium to move along a glucose gradient towards higher concentrations of nutrients. The flagellum is made up from a combination of components which, as is assumed, on their own could not have emerged by themselves. Already a small filament for instance - which in the flagellum might exceed the bacterium's body size several times - would be a severe impediment for survival and thus would never have withstood natural selection in the first place. In its combination of several such parts which by themselves are highly unlikely, the flagellum thus is seen as a proof for the existence of an intelligent designer or a creator. Just like an outboard motor, the flagellum has a rotating and a stationary element embedded in the cell wall and membrane. These elements are connected to the flexible filament by a hook. The parts list for these three components includes about 40 different proteins, making up an ensemble that seems carefully crafted by an intelligent designer to work together for an intended purpose. The comparison with an engine created by an engineer indeed seems very enticing. However, it is scientifically not needed. According to the principle of Occam's razor, a scientific hypothesis is valid and reasonable if it is the least complex one that suffices to describe the phenomenon in question. Modern sciences, and in particular systems sciences manage to explain the flagellum without assumption of any intelligent design. A first part of such an explanation is paved by the concept of emergence, stating that new qualities can emerge from the interplay of a multitude of components which by themselves do not show these qualities. In more details this concept is discussed here. In the case of the flagellum, the quality of mobility would have to be seen as the property of a system emerging from components which by themselves do not show mobility nor any relation to it. This however, does not yet answer the question how these components evolved in the first place. The second part of the answer hence draws on evolutionary developmental biology, aka evo-devo, comparing developmental processes of different organisms and exploring how developmental processes evolve. In this approach the interrelation and interaction of organisms with their environment is emphasized. The environment of an organism - or more generally of a system - is seen as something which is not just endured passively, but is always also influenced and actively altered by the system. Systems work on their environment, they construct it, thereby creating niches in which to survive. This implies that organisms - or systems - are never just passively subject to natural selection, but also effectuate specific selection processes onto other organisms (or systems). Evolution in this sense is always co-evolution of a multitude of organisms (or systems). No system is a system on its own. Regarding emergence, co-evolution and the construction of niches, it has been argued that the flagellum is an emergent result of the evolution of components which originally evolved with completely different functions in different contexts. Just as the feathers of birds initially have functioned as heat regulation (by lifting up when too warm) and later were co-opted for bird flight, the components of the flagellum evolved in respect to functions different from locomotion. The actual flagellum hence is an exaptation (sometimes also termed preadaptation) in respect to the mobility of bacteria. Gould Stephen J. / Vrba Elisabeth S. (1982) Exaptation – a missing term in the science of form. Paleobiology 8(1): 4–15. For the understanding of systems' particularities, this is relevant in respect to the often peculiar causal determinations in systems. In particular complex systems never arise linearly from an easily discernable chain of causes and effects. Cause-effect relations rather have to be seen as networks, implying a certain "synchronous asynchrony" of determinants, a "circularity" of causes which defies classical analytical approaches and therefore sometimes is termed paradox. Theoretically, the problem of irreducible complexity, and of the flagellum in particular, is equivalent to the problem of evolutionary paths not being allowed to lead through fitness valleys where organisms would be exposed to extinction. Fitness valleys are parts of the concept of fitness-landscapes, as proposed by Sewal Wright in 1952 to explain the Darwinian metaphor of fitness. 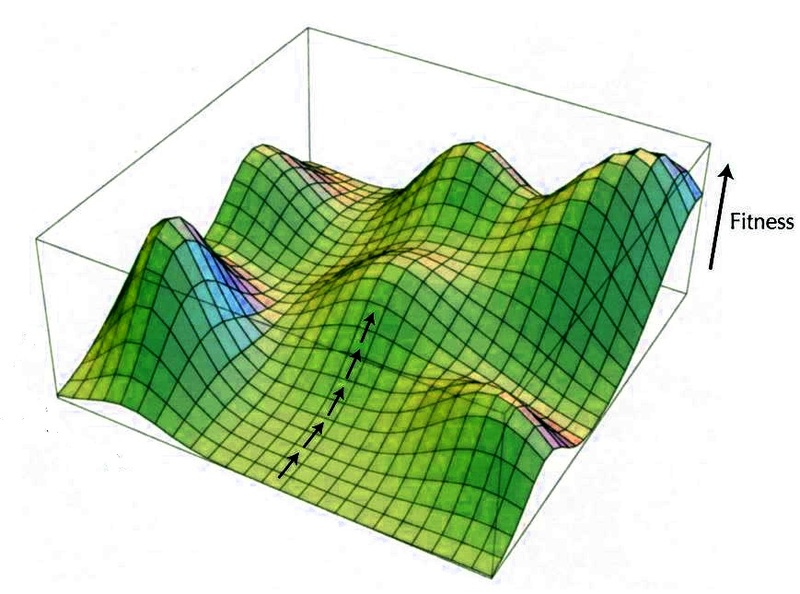 A fitness-landscape is a mathematical function describing fitness as an n-dimensional phenomenon in respect to the fact that the successful adaptation of an organism to its environment is never a one-dimensional process as insinuated in the term "survival of the fittest". On the opposite, adaptation is always a compromise between several contradicting challenges. To gain fitness hence is never a simple maximizing task, but always a task of optimizing. The fitness of an organism or a functional module hence does not evolve in continual growth, but rather tends to find (temporarily) stable equilibria between several environmental constraints. Once such an equilibrium is found, evolution sort of "freezes" on a local crest in the fitness landscape representing an evolutionary lock-in. From there, all further paths would lead through valleys of reduced fitness. A rugged fitness-landscape hence, as in the above image, does not seem to offer chances for further development. No organism could risk to take a path down through a valley without facing extinction. An answer to this problem, equivalent to the above mentioned principles of niche construction and exaptation, builds on the metaphor of dancing fitness landscapes as suggested by Stuart Kauffman. Since organisms are never just subject to the influence of their environment, but actively adapt and alter their environment, a fitness landscape is never just static in the sense of being unalterable given once and for all. Fitness landscapes change and evolve together with the organisms whose fitness they determine. Fitness is always a moving target. Fitness landscapes dance, and thereby open chances for new combinations of features such as the bacterial flagellum. Kauffmann S. (1991) Coevolution to the Edge of Chaos: Coupled Fitness Landscapes, Poised States, and Coevolutionary Avalanches. Journal for theoretical Biology 149, 467-505. However, dynamical equilibria themselves face the trade-off between being sufficiently dynamic in order to support continual evolution and on the other hand not being too dynamic to impede adaptation. Continual and rapid change would not leave the time needed for an organism to adapt. That's why Stuart Kauffman and others reason about additional principles of co-evolving organization ﬂexible enough to change but ﬁrm enough to resist change. A possibility for such a higher order principle of co-evolution is seen in the Theory of Self-organized Criticality.